Prestigious property with various amenities near restaurant Lebeda in Pancherevo spa resort, 12 km southeast of Sofia center, between Vitosha and Lozen mountains. The property consists of a luxury house (875 sq.m.) with garage for eight cars, well-kept garden (2387 sq.m.) with decorative plants, watering system, gazebo with artificial creek and waterfall, completed with massive fence. The newly-built solid building has magnificent views of the lake in Pancherevo and the Lozen mountain. First floor - a large living room, a study, a kitchen with dining area, a veranda (with access form the living room, office and kitchen) overlooking the lake, a guest bedroom with bathroom, two bedrooms with walk-in closet, bathroom and fireplace, a master bedroom with bathroom, walk-in closet, fireplace and exit onto the porch. The floors are of teak, marble and granite. The house has insulation. The property is supplied with electricity, water and sewerage system. It is equipped with heating system and fireplaces. The dwelling is sold without furniture and equipment, but with the decorations. The yard is very well arranged. The house has great location, amongst fresh air and tranquility, yet close to Sofia (the airport is 14 km away). This lovely property is characterized by excellent communication, near Samokovsko shose, Ring road, Gorublyane and Bistritsa dstricts. 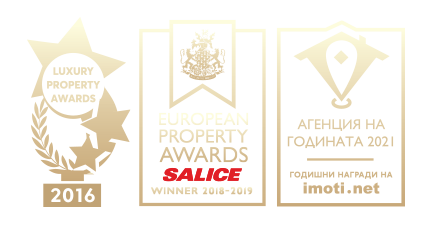 The village has all the necessary facilities and services with easy access to the Business Park Sofia, Tsarigradsko shoes, to the town of Samokov and the prestigious mountain resort Borovets.